For me too, the periodic table was a passion. ... As a boy, I stood in front of the display for hours, thinking how wonderful it was that each of those metal foils and jars of gas had its own distinct personality. 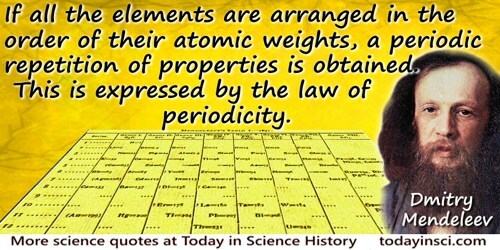 Recollection of being unimpressed in high school when taught that carbon, being the basic building block of life, was the most important element in the periodic table. In Chappell Brown, 'A Carbon Copy of the Real Thing', Electronic Engineering Times (28 Dec 1998), 50. The eighth element, starting from a given one, is a kind of repetition of the first, like the eighth note of an octave in music. 'Letter to the Editor', Chemical News (1864), 10, 94. 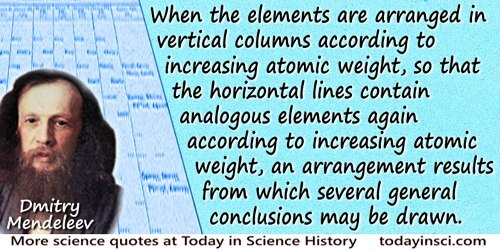 When the elements are arranged in vertical columns according to increasing atomic weight, so that the horizontal lines contain analogous elements again according to increasing atomic weight, an arrangement results from which several general conclusions may be drawn. 'The Relations of the Properties to the Atomic Weights of the Elements', Zeitschrift fur Chemie, 1869. You can find that sort of regularity in Stock Exchange quotations. As quoted in Stanley I. Levy, 'Brauner Memorial Lecture', Journal of the Chemical Society (1935), Pt. 2, 1878. It has also been quoted as “One might just as well seek regularities in the figures of stock exchange bulletins” in L. Vlasov and D. Trifonov, trans. from Russian by David Sobolev, 107 Stories About Chemistry (1970). [The] structural theory is of extreme simplicity. It assumes that the molecule is held together by links between one atom and the next: that every kind of atom can form a definite small number of such links: that these can be single, double or triple: that the groups may take up any position possible by rotation round the line of a single but not round that of a double link: finally that with all the elements of the first short period [of the periodic table], and with many others as well, the angles between the valencies are approximately those formed by joining the centre of a regular tetrahedron to its angular points. No assumption whatever is made as to the mechanism of the linkage. Through the whole development of organic chemistry this theory has always proved capable of providing a different structure for every different compound that can be isolated. Among the hundreds of thousands of known substances, there are never more isomeric forms than the theory permits. Presidential Address to the Chemical Society (16 Apr 1936), Journal of the Chemical Society (1936), 533.